This totally makes up for those polenta squares filled with cheese. Seasonality, thy name is Thursday Night Smackdown! I chopped the fruit and veg for the salad first, so they could sit together and meld while I made the soup. It’s really more of a chunky salsa, but I’m choosing to call it a chopped salad because I like the way that sounds. A ripe peach, a few tomatoes, half a red onion and a pinch of salt later, I set the salad aside to stew in its own juices. ***Oh asides, how I’ve missed you! It’s been too long. Shucking corn indoors is almost, but not quite, an impediment to dealing with corn at all; the fricking silk worms its way into everything and onto everyone, and you spend half your cooking time chasing errant strings around the house. Hooray for open floor plan living! Once the corn was wrangled, I mercilessly hacked the kernels from the cob with such violence that several of them flew a considerable distance. I get a little uppity, because a corn cob killed my uncle. The corn nubbins joined a small potato (to add body to the soup) and a sweet onion in some gently foaming butter, where they relaxed for a few minutes before being unceremoniously doused with stock and left to simmer. Once the kernels and potato were tender, they took a one-way ride in the Blendertron with some milk, with the resulting liquid forced through a sieve to achieve Ultimate Smoothness. I did it twice to assure that I’d have a perfectly creamy base unsullied by any hint of cellulose and then I had a psychotic break, because who the hell am I with this double-straining? I don’t even like straining things once. That Thomas Keller, he sneaks into your head like a ninja all Inception-like and plants his love of sieves without you even realizing. Corn soup alone does not a dinner make, so while the soup chilled I found some shrimp of questionable age in the freezer and decided to thaw them out and cook them off. Obviously, if you’re a vegetarian, you could nix the shrimp (even the milk and butter, if you’re vegan) and pair this with a hearty salad or a grilled cheese sandwich. Ha ha, I kid! As though there are any vegetarians here! Or vegans; if there are any, I’m pretty sure they’re just monitoring things for the next time vegans are insulted. Hello, defensive vegans! Anyway, I dusted the shrimp with chile powder and paprika, hit them with salt and seared them quickly in olive oil. I ladled some soup into a bowl, heaped some of the chopped salad in the center and propped a couple of shrimp around, a miniature, edible fort-with-moat. This dinner was satisfying in so many ways. First off, it was painfully seasonal, so I got to pat myself on the back for that and feel self-satisfied. In addition to feeding my ego, it was also deeply satisfying to my mouth and gut. 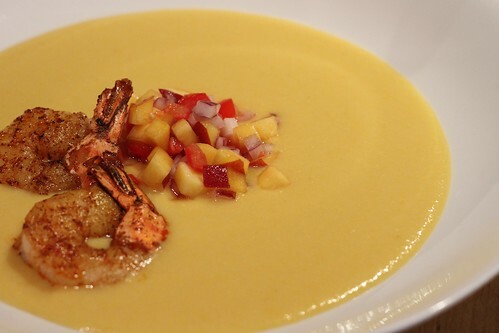 It was a lively mix of visuals and temperatures and textures and tastes – the confetti of the salad against a bright yellow field; cold soup against hot shrimp; creamy puree highlighting the crunchy salad; sweet corn and peach, acidic tomatoes and biting onions paired with spicy shrimp. It was an interesting twist on the peach salsas and corn-and-tomato salads that pop up so often at this time of year that was as fun to eat as it looked. Brian, to torment me, described the dish variously as “fine,” “okay,” and “adequate,” but his scraped-clean bowl belies his disaffected nature. This is a winner. 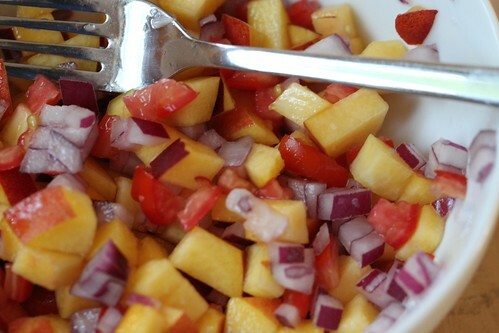 Make the salad: Dice the peach, tomatoes and red onion into relatively even-sized pieces. Toss with a pinch of salt, and let sit. Make the soup: Chop the yellow onion roughly. Peel and chop the potato. Cut the kernels off the corn cobs. Heat a saucepan over medium heat and add the butter. When it melts, add the onion, potato and corn. Saute for a few minutes, then add the stock and a pinch of salt. 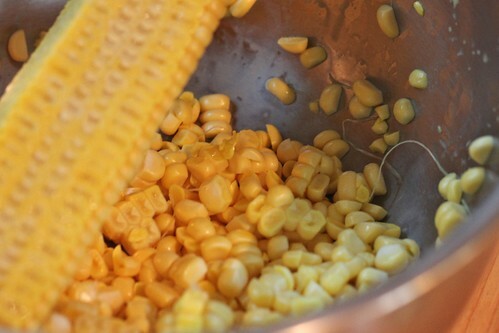 Simmer until the corn and potato are tender, 10 or 15 minutes. 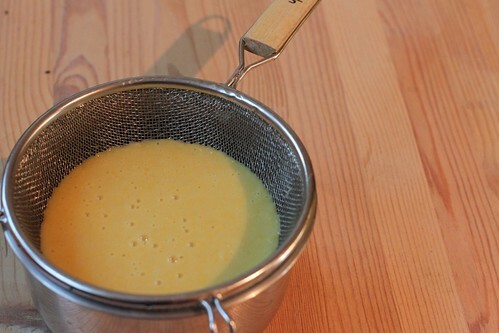 Blend the corn mixture with the milk/cream, passing the soup through a sieve after it’s been blended. Check the seasoning and add more salt if needed; depends on the salinity of your stock. Chill. 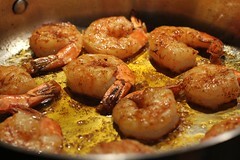 Make the shrimp: Heat a heavy skillet over medium-high heat; add the olive oil. 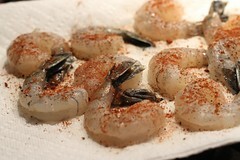 Dust the shrimp with the chile and paprika and sprinkle with salt. Sear, a minute or two per side, until shrimp are just cooked through. Assemble: Ladle the soup into bowls. Spoon a pile of salad in the middle, and place shrimp around salad. Serve immediately. My husband wouldn’t eat this as is; each part? Sure. No cold soup, no fruit with meat (or protein..) yada. So I’m gonna make this for my soon to be recovering mom (rotator cuff repair…ick)!! And Michigan has the same kind of bounty, lemme tell ya. If you find yourself there in the summer? Find one of the ubiquitous farmer’s markets and see for yourself! When you say things like, “[I]t was also deeply pleasing to my mouth and gut,” I want to bend you over and have my way with you, and I don’t even like you like that. ummm, or satisfying. either way. works for me. I’m a vegetarian, Michelle, and I love you and read TNS like a stalker. But I grew up in Nebraska, so I’m not afraid of a little bacon-posting. Imma make the hell out of this soup the minute I can acquire some good corn. This is a very delightful combination. 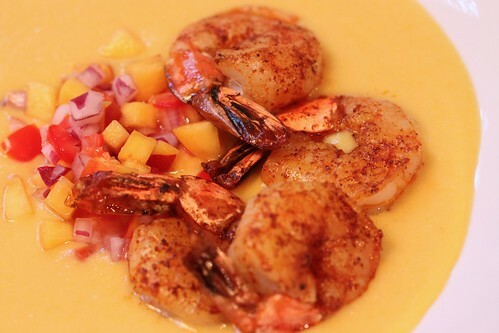 Peach and tomato with shrimp sounds fantastic. And I think the sauce fits perfect too. I will try this tomorrow. Thanks a lot. I think I’m in love. Got shrimps in the freezer, and this is getting made the next meal I cook at home (which may well be this weekend). Oh, and inquiring minds want to know how the corncob killed your uncle. I made this tonight! No photos as we ate it too fast. We had leftovers of the salad, which will be great as a side for lunch tomorrow. Thanks for the recipe! Looks awesome! I have a ton of corn and peaches right now. Perfect way to use them up! I made it, and while no, it wasn’t exactly as you did it was close. Poor timing left us with warm soup, but it was ALL good. I have made a corn soup convert of an old friend, in the process. YAY.